When I was standing around my father’s bike shop and I saw many pro cyclists coming in. I was a young boy, around 10 years old, and that’s when I knew I wanted to be a cyclist. Greatest racing memory: The Tour de France win with Cadel Evans. We had a very special group and it was my first Tour de France. Going into Paris in yellow was really something incredible. We chased this for many years after and I didn’t really realize just how amazing it was at the time. Race I dream of winning: Paris-Roubaix. I have a good memory of the race from my U23 days and it really matches my characteristics, better than the Flemish classics because I am not so explosive. As a kid, it is one of the first races I remember watching. If I wasn't a pro cyclist: Probably an architect. Even before I built my house I was interested in architecture and now even more so. Michael Schär, who is heading into his 10th season with CCC Team, is the epitome of a superdomestique. 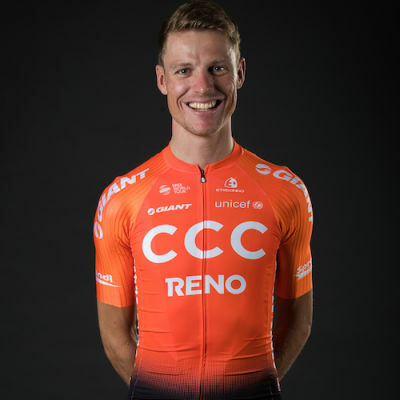 The former Swiss national road race champion is one of the team’s most experienced riders with grand tour participations, including the 2011 Tour de France in support of overall winner Cadel Evans. Schär, who is often seen driving the front of the peloton, is not only an asset in stage races, but also on the cobbles. Throughout his career, he has raced 32 monuments and countless classics, playing an invaluable role in helping the likes of Greg Van Avermaet to victory.